PubSub+ helps communications service providers dynamically provision, deliver and bill for next-generation content and services. 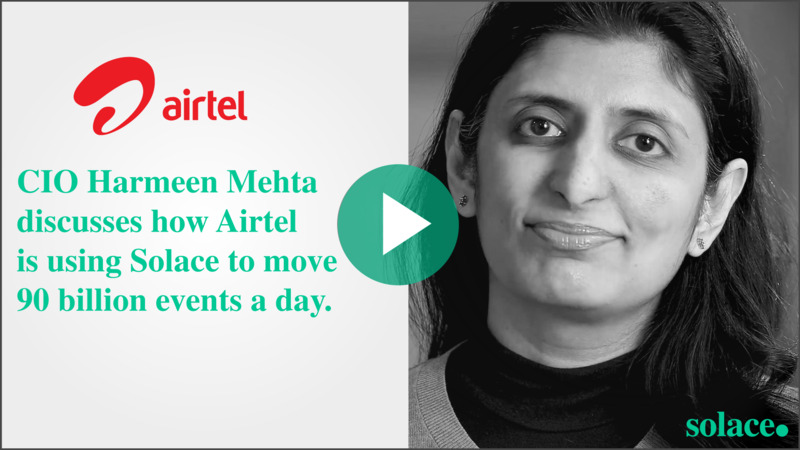 Through Airtel and Jio alone we’ve helped to connect over 450 million citizens in India. Every second a customer has to wait for a service they’ve ordered influences their satisfaction, whether it’s international coverage, prepaid minutes or a short-lived data-driven service related to their location or an event they’re attending. Solace helps service providers accelerate order-to-activation cycles by routing orders to provisioning systems in real-time, while buffering orders and forwarding them at whatever rate those downstream systems can handle. For most service providers, it can take months to introduce new products due to incompatibilities between systems and the requirements of new data sources or presentation technologies. Solace can slash the time it takes service providers to introduce innovative new products. Since Solace runs in all popular clouds and datacenter environments, and supports open APIs and protocols, service providers can quickly tie together diverse data sources, interactive services and presentation technologies to formulate exciting new products. Communications service providers need to aggregate CDRs from a variety of network elements in different formats, and convert them into a canonical format for archival and analysis. Solace can simplify this process by ingesting CDRs in any format and efficiently routing them to systems that need them, buffering as necessary to ensure that messages aren’t lost and systems aren’t overwhelmed by sudden bursts of data. Today’s communications service providers need a complete and up-to-the-second understanding of each customer’s activity, preferences and usage patterns in order to do things like spot potential problems before the customer is impacted, and identify cross-sell/up-sell opportunities. Solace can help by streaming information to analytics engines and AI platforms while simultaneously making it accessible to all kinds of dashboards, charting applications and web interfaces. Communication service providers are perfectly positioned to provide the infrastructure for large-scale industrial Internet of Things projects. With the ability to efficiently route massive amounts of event-driven information between tens of millions of devices and applications running in hybrid cloud environments, Solace can help them bring to market robust IoT infrastructure offerings. To securely manage interactions with number portability clearinghouses, service providers put in place a gateway that acts as an intermediary with their internal systems. This gateway must be secure as it faces the outside world, and highly available because of SLAs that limit how long they have to complete number migrations. Solace can improve a service provider’s number portability processing with the capacity to securely handle any number of inbound our outbound requests, even in unexpected bursts, and can buffer data flow so back-end systems are never overwhelmed. How can we help improve your telecom efforts?